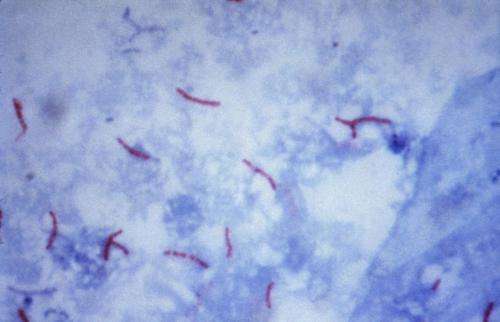 The World Health Organization (WHO) calls tuberculosis drug resistance "a formidable obstacle" to treatment and prevention of a disease that killed 240,000 people in 2016. The Brock team's latest technology builds on an earlier version of the microscopic robot—called the three-dimensional DNA nanomachine—they created in 2016 to detect diseases in a blood sample within 30 minutes. The WHO says resistance occurs mostly because patients don't adhere to the strict schedule of antibiotics they need to take to get cured. The bacterial cells' genes change so that the bacteria can survive future exposures to the same antibiotics, which means a second-line treatment is then required. It takes a while before health-care professionals and patients realize the first-line drugs aren't working, which is why quick detection of drug resistance is so crucial, Li says. "Once you confirm there is tuberculosis infection, you have to use the diagnosis to guide the therapeutic strategy," he says. "Normal infection and drug-resistant strains require two completely different types of strategies." The Brock team's nanomachine consists of a 20-nanometre particle made out of gold. Short and long DNA strands are attached to the gold particle and these DNA molecules are used as building blocks to construct and operate the nanomachine. Graduate student Alex Guan Wang used a computer simulation model to design the long strands, which are able to seek out differences in nucleotides contained within the tuberculosis bacteria's genes. A nucleotide is the basic structural unit and building block for DNA, and it's within these that mutations caused by drug resistance would be found. The team's findings are contained in their paper "Simulation-guided engineering of an enzyme-powered three-dimensional DNA nanomachine for discriminating single nucleotide variants," published June 30 in the journal Chemical Science. Feng Li and his collaborators also produced another research paper in the journal Analytical Chemistry, describing how to modify the nanomachine to detect diseases by examining a number of proteins in samples.